Western prairies have a butterfly that is magnificently beautiful. The name regal, which is part of its common name describes it. The regal fritillary is about the size of a monarch, and is a lovely dark brown with silvery spots on its hindwings. It is generally considered a prairie obligate. Caterpillars of this species feed on prairie and birdfoot violet mostly, although some populations may use another species of violet. 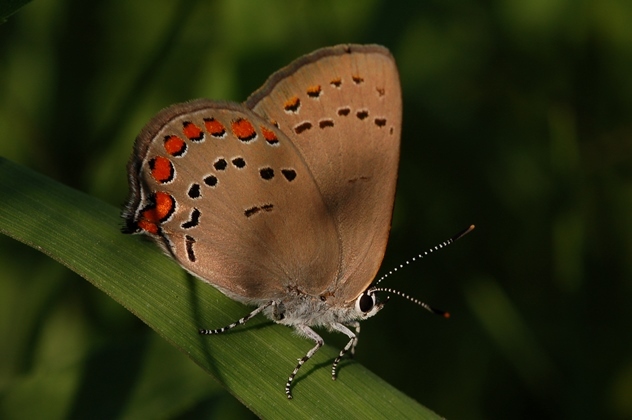 This butterfly was formerly common all over the United States, but was mostly wiped out east of the Mississippi by development. There is a population at Fort Indiantown Gap in Pennsylvania, but it is mostly gone elsewhere in the east. 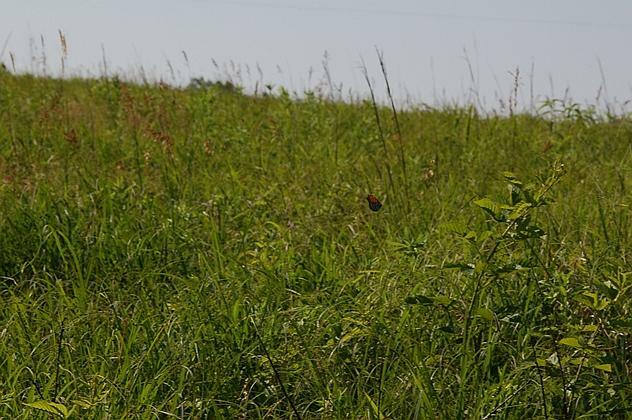 Iowa is fortunate enough to have some prairies with populations of this butterfly, and they seem to be doing well lately, unlike a number of other prairie obligate butterflies. I have seen this butterfly a number of times, but only have a small number of low quality photos of it. My idea of a great photo of this butterfly would be one lit from the front to show the silvery spots, and close enough to fill the frame with the butterfly. I would love to have it on a prairie flower, with a nice sky blue background. So I visited a couple of prairies where they are known to occur, Rolling Thunder Prairie and Medora Prairie, both in Warren County, Iowa. Rolling Thunder is owned by the Iowa Department of Natural Resources, and Medora is owned by The Nature Conservancy. 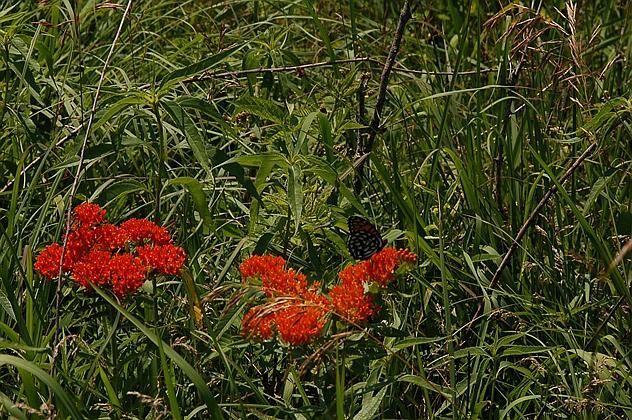 Butterflies were thick at Medora. Common wood nymphs were everywhere, looking particularly dark. I spooked up a coral hairstreak right away. This is a fairly rare butterfly, but I have been having some pretty good luck with it in the past few days. Butterfly milkweed was blooming everywhere, so I thought I should at least find some nice butterflies to photograph. But I was mostly looking for the regal. I wondered around for probably forty five minutes before I finally saw a regal. It flew a few feet over the prairie, and covered a lot of ground. I gave chase. Now I am neither a young man, nor a particularly fit man, and prairies are hot and humid. Soon it had me out of breath and wanting water. But I clicked my camera first at this regal, then at another one that showed up. Catching shots of butterflies on the wing is always iffy. I have a number of shots of unrecognizable blurs, but this one shows the regal. Regals are easily to identify on the wing. They really can’t be mistaken for any other butterfly around here. So I chased for a while, then went back to the car for a water break. Then I went looking for regals again. They showed up quite frequently, but seldom set down. Three times I saw one land on a butterfly milkweed plant, and took photos, all the while trying to sneak up on them. This is as close as I came to a sitting regal–maybe eight or ten feet away. This is now, marginally, the best photo I have of a regal fritillary. They did fly close enough that I almost could have reached out and grabbed one, but they are fast, and I have no butterfly grabbing skills. So I spent about five hours in the two prairies, got lots of good views of the regal but no quality photographs of it. I did get some good photographs of other species, though. All in all, it was a pretty good way to waste a day. 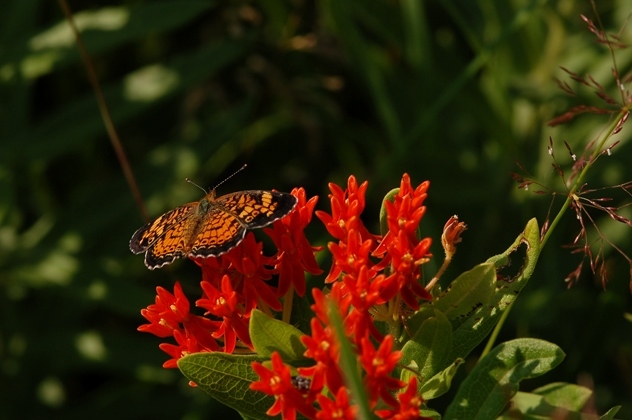 This entry was posted in butterflies, photography and tagged Asclepias tuberosa, butterflying, macro photography, prairies, Regal Fritillary. Bookmark the permalink. OK, there are surely somewhat better live photographs of regal fritillaries but you did a fine job. I’m just hoping to encounter an identifiable one. Good luck. I could give you some locations here in Iowa if you make it out this way. I must say that I enjoyed this refreshingly honest account of the real-life search for butterflies in habitat new to you and apparently without a local guide. After 13 years of doing what you do, i have never enjoyed the assistance of a local who came out to enable me to locate f-flies. So, as you know, much time flies by, unproductive and a tiny bit frustrating. Of course, all of the above just further ignites the burning desire to continue to ………. Frustrating perhaps, but I can think of worse ways to spend a day and I bet you really enjoyed the challenge!